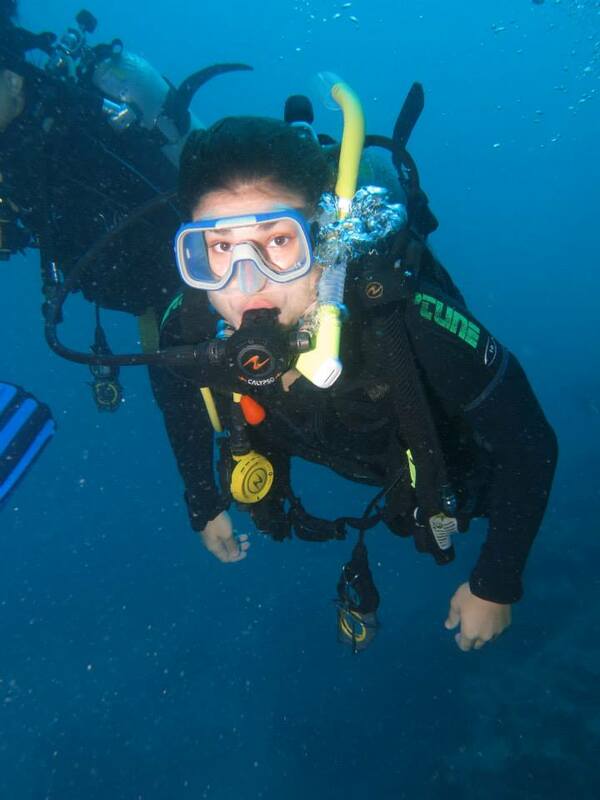 I was well enough to go diving yesterday! I have to say that it was one of the most incredible experiences of my life!There is no way to describe the peacefulness I experienced under the water. I did 2 of the 3 dives available, and I wanted to go on the third dive, but I was just so tried that I couldn’t. The first dive was great! It was great to be back in the water and breathing some of the driest air in the world. Our instructor was amazing and the other certified divers were all very fun as well. We would get in the water before the other divers/snorkelers and get out before them as well. We got longer and deeper dives than the intro divers. The boat we went with was great. Plus, I only got sick once on the way out! I find this an accomplishment, especially after having the stomach flu for 36 hours. 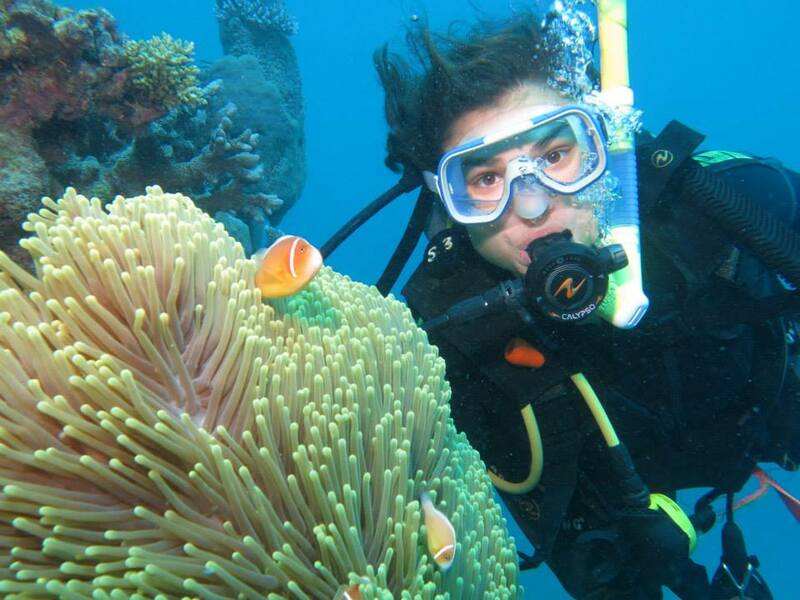 They have a professional photographer that dives with everyone and you can buy your photos! I, of course, bought mine since it was a first real dive and diving the reef was a huge reason I wanted to come to Australia. The water was clear, especially compared to the quarry I did my certification dives in. Here we are getting on the boat! My three friends did an intro dive and loved it. They also snorkeled. 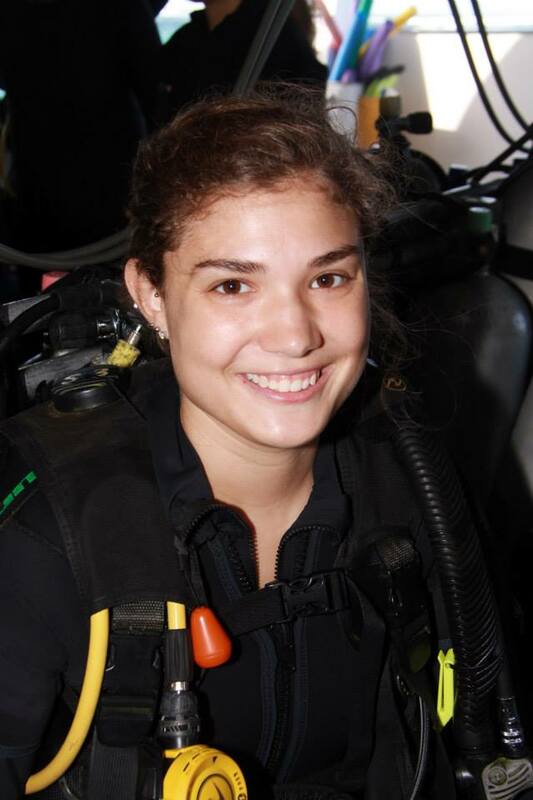 Here I am getting ready to go on my first dive! On our first dive we met the boat’s “pet” fish Nigel. 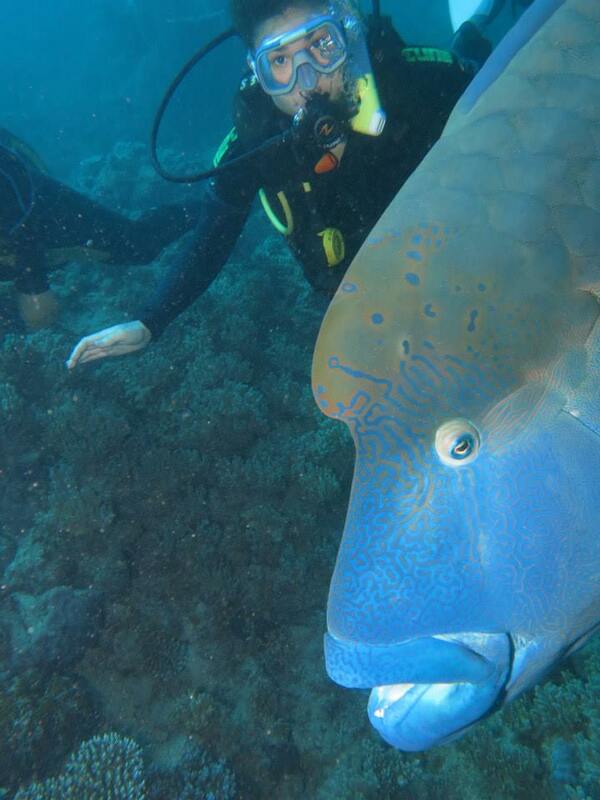 He is a Maori Wrasse fish. Nigel is huge! I would say almost as big as me. He plays with the instructors and the photographers, so they try to get good pictures of everyone with Nigel. 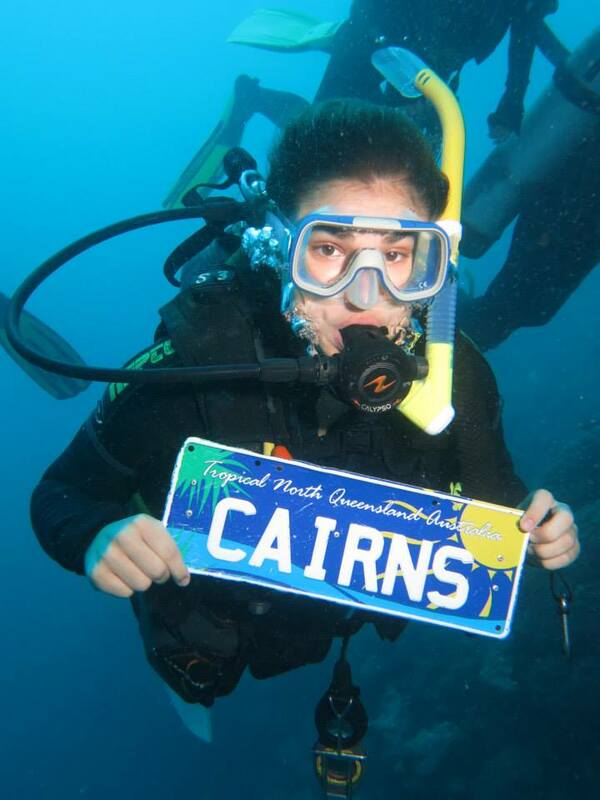 On the first dive we also took pictures with a Cairns license plate, which I guess is a pretty touristy thing, but they turn out cool and it is an awesome keepsake from coming to Cairns. The first dive we saw out first white tipped reef shark and a stingray. There were also a bunch of sea cucumbers and an abundance of different corals. The colors of the fish were just amazing! My goal for the day was to see a sea turtle up close and possibly even touch one! I did both! 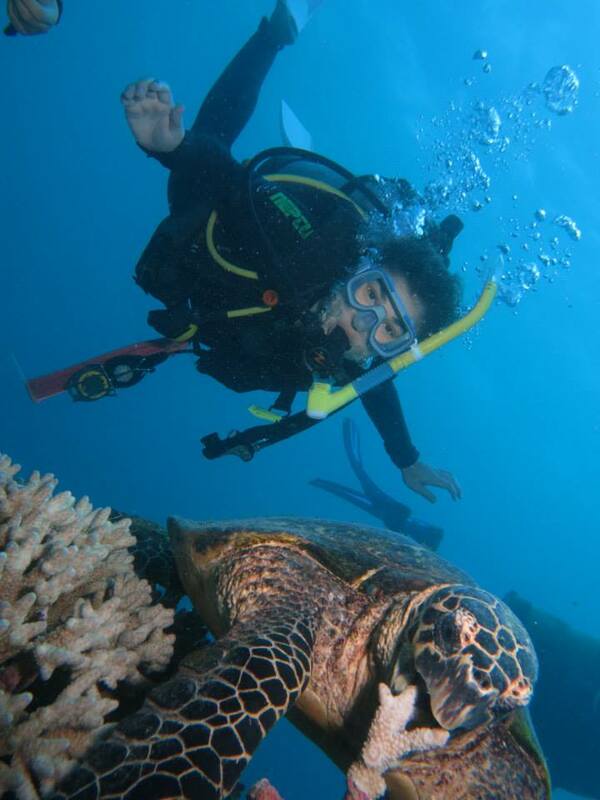 It was an amazing experience and I was one of the only certified divers to get a picture with the turtle! Again we saw a white tipped reef shark, but we were able to get REALLY close to it (about 1-2m away) before it got scared. We also played with another sea turtle, but a green sea turtle the second time. The green turtles get high off of some of the coral so the instructors feed them (they have the munchies) to get them close to us. The second turtle swam within an inch or 2 of my face! Then he stuck around and played with us for a long time before we ended our dive! It was very cool! These memories that I have from this semester are amazing! 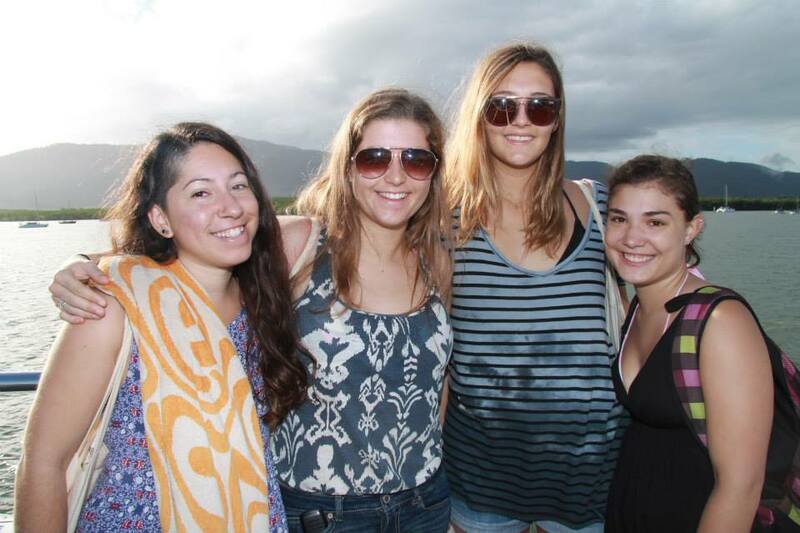 I cannot image a better way to spend a semester abroad!